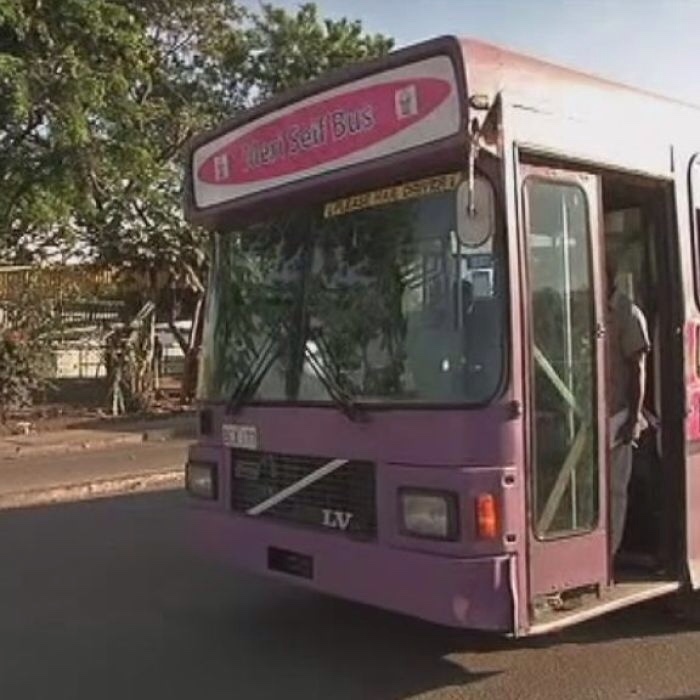 Female bus commuters in Papua New Guinea's capital city Port Moresby can now catch a free women-only bus funded by Australian Aid and the UN, as 90 per cent report they have experienced some form of violence while using the public transport system. Port Moresby is the largest city in PNG and women there are considered to be amongst the least safe in the world; they face the risk of violence and theft every day, but particularly when they travel on the city's Public Motor Vehicles (PMVs). The new safe alternative has only two men onboard, the driver and a security guard – all other men are banned from travelling on the buses. Anne Sipusipu, a teacher in Port Moresby, uses the PMV system to get to work every day, and like many women living in the city, she said she has been a victim of crime on public transport. "My bag has been snatched in one occasion, and my friend's bag as well, which we had to get off the bus and chase after him to get the bags back," she said. Lily Korowa, a high school student who catches PMVs every day, said criminals travelling on public transport often target girls. "Some of the boys snatched my phone and some of my money in my purse," she said. "I feel scared sometimes and not safe to catch the normal PMV bus." The majority of crimes on the PMV system are predominately committed by men, prompting Australian Aid and the UN to fund an hourly run male-free bus for women. Katherine Webber, the United Nation's Safe Cities program coordinator in Port Moresby, said they have found 90 per cent of women have reported experiencing some form of violence at bus stops, travelling to and from the bus stop and on the buses. "So here we are providing a space that they can travel, that they do not experience these forms of violence." The UN's Safe Cities program is a worldwide initiative to stop sexual harassment and other forms of sexual violence towards women in public spaces, giving them more freedom of movement. Ms Korowa said having no men onboard the bus makes it a far better service for women. "There's no man or other male who can steal the stuff and get it, so I prefer this bus," Ms Korowa said. "It's more safe and protective for a woman to get on and go to work or schools than the normal buses." Ms Sipusipu said the male-free bus saves women from the daily harassment she said she and other commuters have to deal with. "When there's a bus like this it saves us and it makes us more comfortable and more safe to travel when there's only ladies travelling," she said. The bus service and a program to improve public transport overall have been funded for the next three years. Ms Webber said the only problem with the women-only bus is that it's too popular. "There has been a very high demand for the bus service that we are unable to meet at this point in time, so we are looking at putting more bus services on the road." Another benefit of the bus is that it is free, which helps women support their families in Port Moresby - a city that can be very expensive to live in. Ms Webber said the next challenge was to stop women being forced to pay more than the normal set fare by introducing cashless ticketing on Port Moresby's PMV buses. "We know that extortion is one the key activities that occurs," she said. "So although there are set fares on the PMVs, people are being charged anything up to four or five kina (AU$1.80-AU$2.30) for a trip across Port Moresby. "So we want to have a set fare that people know what they're going to be charged before they get on." Bus looks like an ex Brisbane Transport volvo.